Description: Aero Fighters 2 (AKA Sonic Wings 2 in Japan) is one of Japans popular classic airplane shoot em up games. 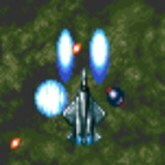 It features intense level landscapes with ruthless fighter plane enemies and unforgettable bosses at the end of each stage . With 6 characters to choose from from the regions of USA, Japan, O.N.U., France and United Kingdom. This one isn't just your standard bullet storm, defeating enemies takes some strategy in certain areas. A great challenge and it's tons of fun. Game Controls: Shift Key = In-cert Coin. Enter Key = Start. Arrow Keys = Move. "X" Key = Shoot. "C" Key = Bomb. See In-game Controls for more options.